Work is in full swing – that’s one thing we weren’t able to say about Stadion Śląski for a long time. The 55,000-capacity giant is again a construction site after nearly 4 years of deadlock. Since mid-2011 the construction site of Stadion Śląski has been more of a conversation piece than actual construction site. Abandoned for a long time, now the place is again lively as groups of workers are preparing to once again attempt and raise the cable roof structure. 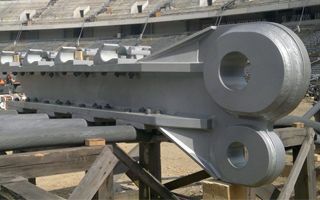 Works were nearly completely halted in July 2011, after two iron clamps of the cable roof broke to pieces and big lift operation was terminated. This was the first such accident worldwide, which resulted in years of examinations and – to some extent – scapegoating. Eventually it was recommended to redesign the roof structure and the clamps themselves. New cable roof has a double inner ring, now with 8 strong cables instead of 4 to better manage tensions. The clamps were also upgraded to larger and assembled elements rather than being cast as one solid piece as before. The images above and below allow for visual comparison of the 2011 and 2015 clamps. Preparations will take around a month more before the second big lift begins. From late June it should take 2 weeks to raise the cables into place. 80 hoists will work simultaneously to stretch the cables safely. If the operation is successful, we’ll see the “never-ending” renovation of Śląski complete in 2016, after… 22 years.